Recently, a friend and I have been pushing each other to focus more on walking in and living life as directed by the Holy Spirit. We are challenging each other tremendously in this area. Had we not been, I am not sure Kathy’s Fruit of the Spirit study would have caught my attention. Why? Having an accountability partner, something I longed for my whole adult life but couldn’t find, has played a large role in tuning my spirit to help me be more in tuned to the Holy Spirit. Meeting regularly. My accountability partner and I meet for discussion about every other week, and we see each other at church on Sundays. 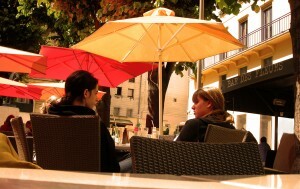 Face-to-face connections provide the glue for relationships. Hebrews 10:25 warns against stopping this habit and connects it with the idea of accountability. Connecting often. In our busy culture, meeting face-to-face regularly can be a struggle. Fortunately, that same culture gives a multitude of ways to connect in between face-to-face meetings. Blogs, email, Facebook, and Twitter provide unique ways to connect with others. The truth that No Man Is An Island holds true more today than ever. Transparent. This does not necessarily mean airing one’s dirty laundry, but it does mean an honesty that gives room for true accountability. I have been in what I thought was an accountability relationship where the other person was not teachable or completely transparent, and I discovered that not only was I wasting my time but “casting pearls to swine” too (Matthew 7:6). Prepared. Just like taking a test without having studied is unwise, so too is expecting accountability to take place when you’ve made no effort to make progress. To prepare for the time with my accountability partner, we both make notes about what the Holy Spirit lays on our hearts, and we come ready to discuss those. There are many ways to prepare for accountability, and the specifics really depend on the unique reasons behind the partnership. Without question, God encourages the idea of accountability. Hebrews 10:24 says to “think of ways to encourage one another to outbursts of love and good deeds.” Whether formally or informally, having people we can encourage and be encouraged by goes a long way in helping us to “hold tightly to the hope we say we have” as well as to “encourage and warn each other, especially now as they day of his coming back again is drawing near” (Hebrews 10:23, 25). DISCUSSION: What other elements need to exist in accountability relationships? This entry was posted in Uncategorized and tagged accountability, connect, encourage, fruit of the spirit, Hebrews 10:23-25, Hebrews 10:24, Hebrews 10:25, Holy Spirit, Matthew 7:6, meet regularly, prepared, Proverbs 23:12, relationships, teachable, transparent by admin. Bookmark the permalink. Kari, great advice and encouragement to pursue an accountability partner! Thank you for posting this! Thanks for checking it out. I hope it\’s helpful in a way that brings glory to God through relationships. Two friends and I have met for a decade together. At one point, we all were pastors in the same town. I now write and one friend now lives 45 minutes away, but we still meet on a regular basis. Our focus has never been on our churches or work as pastors but on life at home as husbands and fathers. I count Greg and Chuck treasures from God. Good word, Kari. Very practical, sound advice. Great example of an accountability relationship. This example hits on another important point… Accountability of this source is about individual growth and refining and not focusing outside of that on others or work or whatever. I can attest to the growth I've experienced when I started getting together regularly with an accountability partner. And our friendship has really deepened because of that. I think, biblically, that's the true model of accountability – just having friends and having relationships. I think one of the dangerous things for us to do is to separate accountability out and make it it's own little social world. The best accountability relationships naturally develop as just part of living in fellowship. You are so right about this! I have accountability partners in every area of life, but this one in particular is where we are purposefully getting at spiritual issues. She was someone who has sat in front of me at church for several years, but we only recently started this more specific journey. God wants us to have multiple relationships to have our multiple needs met (as He uses those relationships) and for us to meet multiple needs. No one person can be everything to us, not even our spouses, except God of course. I belong to a couple of small groups where we are accountable to each other. I have to admit that I have become very cautious about how much I share anymore after being betrayed and rejected by someone I had deeply trusted. The result is that I take more to the Lord for true accountability . . . He never just tells me what I want to hear. Blessings to you, Kari.